My brother and I did a gift swap this year for Christmas – he bought me a ticket to the cricket (in the Members’ Stand, no less), and I catered lunch for his party. Vegan lunch, because one of his friends is vegan and it is of course absolutely necessary to cater for the most interesting / challenging set of food requirements in the bunch. The menu was a great success. The cricket, alas, less so, largely due to the fact that Sri Lanka had a lot of injuries and absolutely no confidence and (despite my enthusiastic barracking and determination that they would bat amazingly and astonish everyone) they lasted about one session before being dismissed shortly after lunch, ending the game on Day 3. Since I am participating in this month’s BakeFest, and since I’ve baked these several times in the last few months (and since, I will confess, new recipes have been a little hard to come by of late, principally because I am in the Sleep All The Time phase of my holidays), it seems appropriate to re-post my chocolate, coconut and raspberry cupcake recipe today. And why not? They are, after all, one of the best recipes I’ve written, and endlessly adaptable, as I’ve been showing over the last year and a half since I created them! 95g raspberries (frozen are fine, but defrost before you start) + 95g for the icing. Or you could use frozen pitted cherries, defrosted, for a proper Cherry Ripe cake, but they would probably need to be blended rather than smashed with a fork. 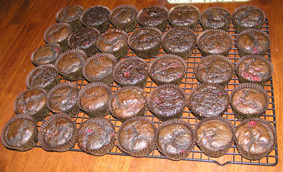 Preheat the oven to 175°C, and line 12 muffin tins with paper cases. Put the coconut milk in a bowl with the cider vinegar, and mix well. Let it stand to thicken for a few minutes. Mash the raspberries well (or blend the cherries, if using), and mix in with the sugar and canola oil. Add in a teaspoon or so of vanilla essence (to taste), and a few drops of raspberry essence or flavouring if you had it. Raspberry liqueur would also work here (but doesn’t it always?). Mix together the dry ingredients (all but the chocolate) in a separate bowl, and sift into the wet ingredients. Actually, I’m far too lazy to do this – I just dump the whole lot into the wet ingredients, just making sure to put the bicarb and baking soda in last so they don’t start reacting with the wet ingredients. Mix everything together well until there are very few lumps and you have a surprisingly convincing cake batter. Divide the batter among your twelve muffin cases – a heaped dessertspoon in each was about right when I did it – and bake for 20-25 minutes, depending on your oven. Yes, I know, that’s more than twelve. Sometimes, I like to make a triple batch. Let the cakes cool on a rack, while you prepare the icing. The icing bears a more-than-passing resemblance to the aforementioned chocolate, coconut and raspberry spread. Smash up your raspberries very well, then melt your chocolate gently with the coconut milk. Mix the whole lot together, and maybe add some raspberry essence or liqueur if you have it. Let cool until it is fairly thick, and then either spoon onto the cakes, or pipe on. If, like me, you have an obsession with edible glitter or edible stars, sprinkle a little of this on top. In terms of dietary requirements, we’re already vegan and nut-free, and I’ve made this recipe very successfully with my low-fructose and gluten-free flour mix, which gives a slightly less airy, but still nicely springy texture. (Actually, I think today’s batch was extra-light because my hand slipped with the vinegar and I actually have no idea how much I wound up using, but it was definitely more than I intended!) Never going to be low-GI, though. As for flavours, we’ve already covered the Cherry Ripe variation. Blackberries or strawberries would also be nice here, though you’d probably need to blend those, too, and strawberries might be insipid, so that’s one to keep an eye on. 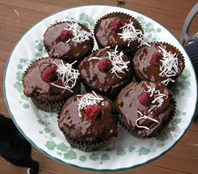 Frankly, this recipe is the base for practically all my vegan cupcake recipes – you can replace the cocoa with plain flour (and use gluten-free), keep the raspberries whole and add orange or lemon zest, and get a totally different cake which still works beautifully. Or you could use almond milk or rice milk if you hate coconut, and get an entirely different flavour – actually, adding almond milk and kirsch to the aforementioned puréed cherry version, would give you a great base for a black forest cupcake – I’d fill it with a vegan butter-cream or an almond cream like this one, and decorate with black cherries and grated dark chocolate. Yum. Or for a plain chocolate cake, melt 90g dark chocolate instead of the raspberries, use soy or rice milk, and a little espresso or hazelnut liqueur if that floats your boat, and go wild. The possibilities are endless! 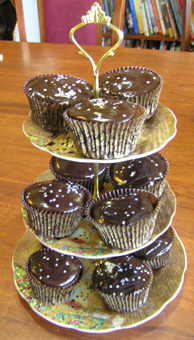 The cupcakes look inviting and loved the variations mentioned. Thank you! They are one of my favourite vegan things to make. What would be my chances of getting recipes for the Olive and Herb Paté, also Roman, (Veganised), and Raw Tacos from Practically Raw (pistachio and walnut nut-meat, cashew nacho cheese sauce, guacamole and salsa fresca, stuffed into lettuce leaves and eaten with corn chips) from you? I’m entertaining some vegan friends on Friday night and these sound lovely! Sorry, only just saw this. Will type them up and email them through to you (I don’t want to put them on my blog for copyright reasons).